Should 500 men, ordinary men chosen accidentally from among the unemployed, override the judgment — the deliberate judgment — of millions of people who are engaged in the industry which makes the wealth of the country? –David Lloyd George in an 1909 speech given in Newcastle in which he blasted the House of Lords for opposing property taxes. In his most recent post, Matthew Kahn describes me as someone who believes that people want to keep up with the Joneses.Â But Iâ€™ve never felt comfortable with that way of characterizing peopleâ€™s concerns about relative income, because of its apparent implication that inequality wouldnâ€™t matter if only people could learn to ignore negative emotions like envy and jealousy. Yet relative income matters for a host of reasons that have nothing to do with such emotions.Â Thatâ€™s because our ability to achieve important life goals often depends strongly on how much we spend in relative terms. If youâ€™re applying for a job, for example, youâ€™re advised to look good when you go for your interview. But looking good is an inescapably relative concept. If other applicants spend more on clothing, your best bet may be to spend more as well, even though your likelihood of a callback wonâ€™t rise if all spend more.Â Yet if others spend more and you donâ€™t, your odds will fall. Similarly, the relative amount you spend on housing affects your ability to send your children to good schools, because a good school is also an inherently relative concept. In almost every local environment, the good schools tend to be those located in more expensive neighborhoods. To send your children to one, you must outbid others for the relatively expensive housing in the neighborhoods they serve. Failure to recognize the instrumental role of relative spending explains why many fail to recognize that rising income inequality has imposed large economic costs on middle-income families.Â The problem stems from a multi-step process that Adam Seth Levine, Oege Dijk, and I have called expenditure cascades. The first step occurs when people at the top spend more, which theyâ€™ve been doing simply because they have so much more money. When they build bigger mansions, they shift the frame of reference that shapes demands for those with slightly lower incomes, who travel in overlapping social circles.Â The near rich respond by building bigger houses as well, which shifts the frame of reference for others just below them, and so on, all the way down the income ladder. This cascade is the most parsimonious explanation for the striking fact that the median new single-family house in the United States, which stood at 1,570 square feet in 1970, had grown to more than 2,300 square feet by 2007.Â That growth cannot be explained by growth in the median wage or median family income, which changed by much smaller amounts during those years. What changed dramatically was the context in which the median familyâ€™s housing choice was made.Â Any family that failed to rent or purchase a house near the median of its local price distribution would have had to send its children to below-average schools.Â So a family that was determined not to see its children fall behind had little choice but to keep pace with what similarly situated families were spending on housing. The figure at the top of this post (an updated version of one described in more detail here) shows how much more difficult keeping pace has become for the median family. Taking the implicit monthly cost of a house to be roughly one percent of its purchase price, it plots the number of hours each month the median earner would have needed to work to meet that cost during the last 60 years.Â During the immediate postwar decades, when the income distribution was stable, the median burden of homeownership varied little, and was actually slightly lower in 1970 (41.5 monthly hours of work) than in 1950 (42.5 hours).Â But as income inequality began rising sharply in the 1970s, the toil index rose in tandem. By 2010, the median worker had to work 82.9 hours a monthâ€”almost twice as many as in 1970â€”to put her family into a house of median price. Housing is of course not the only expenditure that is sensitive to context.Â Explosive income growth at the top has also spawned similar expenditure cascades for items such as clothing, gifts, birthday parties, and other celebrations to mark special occasions. In these domains as well, the median earner must now spend more than before or else endure significant adverse consequences of one kind or another. Of course, Matthew Kahn would be correct to note that not all such spending has been purely wasteful.Â Although the utility conferred by a diamond ring may depend largely on its relative size and quality, for example, even the lone resident of a desert island might take additional pleasure in the way an absolutely larger stone refracts the light. Yet surely much of the extra spending of recent years has been a relatively inefficient source of extra utility.Â The average American wedding now costs almost $30,000, nearly twice as much as in 1990. Does anyone believe that the extra spending has made couples and their families any happier? Higher outlays of this sort crowd out other forms of spending that would produce real improvements in the quality of life.Â If houses grew less rapidly, for example, we could invest in mass transit systems that would yield shorter, less stressful, commutes that would free up more time to spend with friends and family.Â Or we could support medical research and safety investments that would reduce premature death.Â The list goes on. Inequality apologists like to remind us that the poor now enjoy many conveniences that even the very rich didnâ€™t enjoy earlier.Â But saying that rising income inequality has imposed enormous costs on middle-income families is not the same as saying that such families were better off a century ago.Â Absolute income also matters, and everyone is indeed better off in many ways because it is so much higher now than in the past. 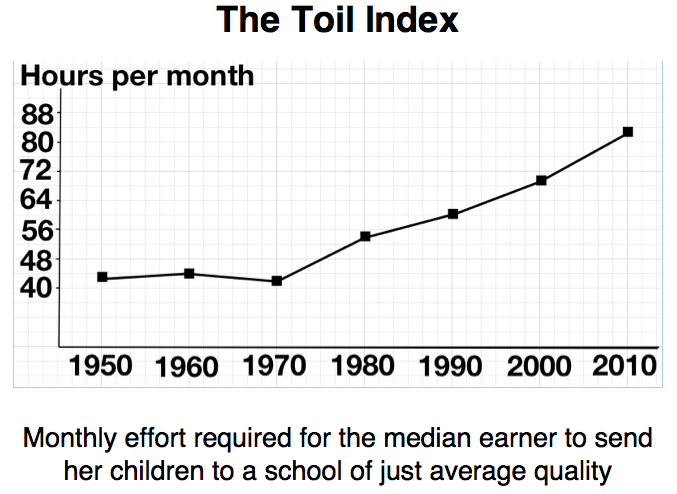 Saying that inequality has been costly is also not the same as saying that the optimal amount of inequality is zero. Few people would work if everyone were guaranteed an equal share of the national income irrespective of effort, in which case we would all be poor in absolute terms. Yet precisely because relative spending power is so important for instrumental reasons, even very small absolute income differentials are sufficient to stimulate high levels of effort. There is no credible evidence that national income would fall if income disparities were to shrink substantially from todayâ€™s levels, and there is actually considerable reason for believing that it would be higher. Many of the substantial costs associated with high income disparities are thus completely gratuitous. When the wealthy all build bigger mansions and stage more elaborate parties, they succeed only in raising the bar that defines adequate. Â The associated waste is all the more troubling because it would be easy to eliminate soÂ much of it with some simple changes in tax policy. “Cliff” speech mentions immigration, global warming, infrastructure, and gun violence. A couple of things to note from the President’s statement after the House stepped back from the cliff (other than his strong reiteration of a refusal to deal about the debt ceiling, which he correctly identified as whether the Congress would renege on paying the bills for spending the Congress had ordered): his list of topics other than the budget that need the country’s attention included immigration, climate change, infrastructure, and gun violence. Republicans vote 151-85 to crash the economy and raise taxes on the middle class. Democrats vote 174-16 the other way. Why can’t David Espo and Alan Fram at the Associated Press get that basic fact into a 38-paragraph story, instead of blandly and misleadingly reporting that the vote was “bipartisan”? If there’s no price to be paid for irresponsibility, no wonder there’s so much of it going around. Apparently the votes aren’t there for an amendment, so the House will pass the Senate bill tonight. Third update Bill passes. Nearly two thirds of Republicans vote for disaster. Second update Voting now. Yup: looks as if a majority of Republicans will vote to let taxes rise for all non-rich Americans, while also crashing the markets. Amazing, when you think about it. Update House now voting on the Rule to bring the Senate bill to the floor. No provision for amendments. 1. Boehner promised a vote on whatever the Senate did. 2. Most of the Republicans hate the deal. 3. Boehner told them that if they could assemble a majority for an amendment, he’d allow a vote on the amendment. Presumably that would be something Ryanesque about encouraging poor people to starve. 4. But the Senate has gone home, and Reid says no vote on an amended bill. 5. If the House Repubs reject a bill that got 89 votes in the Senate, there’s no doubt who gets the blame. 6. So there won’t be 216 Republican votes for an amendment, and therefore no amendment will be offered. 7. The Senate bill will then come up for a vote, and pass with virtually all the Democrats and a few of the Republicans, including Boehner but not Cantor. That vote is expected to be tonight. So the Teahadis get what they want, which is a chance to say they voted “No.” But Boehner has to step back from the “Hastert Rule” against voting on legislation that doesn’t have majority support within the House Republican Conference. Author Mark KleimanPosted on January 1, 2013 January 1, 2013 Categories UncategorizedTags Taxation34 Comments on Back from the cliff? Can a cut in value-added tax stimulate economic growth? In the United States, when we debate whether tax cuts can stimulate a sluggish economy, we are typically thinking of income tax cuts. But such cuts tend to maximize inequality and are also slow to have an impact (not everyone has an income-generating opportunity sitting in front of them just waiting for a lower tax rate). Many other governments around the world have an additional policy alternative available, which is to cut value added tax. VAT runs as high as 25% in some countries. Unlike an income tax cut, a VAT cut would be felt instantly and would be progressive in impact. My bleg: Has any country tried a VAT holiday to stimulate their economy, and if so what happened? If there are no policy experiments, are there any modelling white papers at which I could take a look?